Dog adoption flyer gets a "citizen citation"
I work for a large state agency in Texas. I have been fostering Truffle for over a year now through a fantastic local pit bull rescue, Love-A-Bull. Last week I posted a flyer outside my cubicle in hopes of getting her adopted. 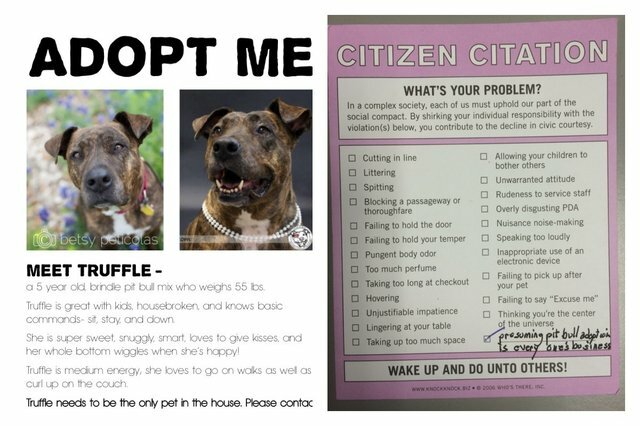 This morning I walked into the office and saw that someone had attached a "citizen citation" to the flyer, stating that my "problem" was "presuming pit bull adoption is everyone's business." Truffle and I are at a loss for words! Who doesn't love pit bulls? Did they think the flyer meant they had to adopt her? And, most importantly, what kind of person goes through the trouble of purchasing, and then handing out, citizen citations?